After originally allowing all digital content from The New Yorker and Wired to be pulled into the Flipboard app, Conde Nast is now pulling back. From now own, Flipboard users will be limited to a hyperlinked headline and a few sentences for stories from those publications. 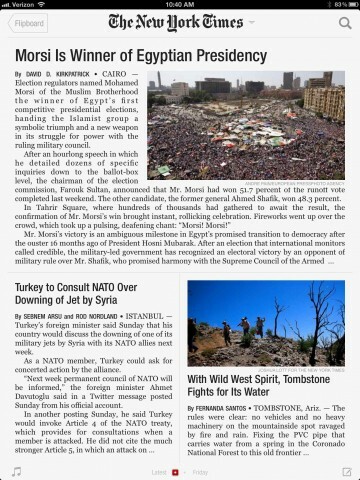 To read the full story, users will have to click through to the magazines’ own web site — that is, out of the Flipboard app. Conde Nast is also pulling back from its efforts to sell ads in the Flipboard feeds for the two publications. Flipboard has been growing rapidly, reaching 1.6 billion “flips” per month in February, according to the company. But Conde Nast, along with other publishers, now see that growth as potentially problematic. The New York Times, meanwhile, is moving in the other direction. After initially limiting Flipboard users to the its various social media feeds, which offer only selected content, the Times said late last week it would make all of its daily content available through the Flipboard app. The catch: full daily content is only available to authenticated Tines subscribers. That is, the Times is integrating its recently erected paywall with the Flipboard app, the first time the paper has extended its pay meter to another company’s platform. The differences between the two strategies are both stark and telling. Conde Nast’s pullback reflects content originators’ abiding fear of aggregation. Even though aggregation can increase total readership or viewership, it can also divert readership from the originators’ own digital presentation. And even if the original publisher is able to sell advertising against that aggregated readership, it rarely earns enough revenue from those sales to make up for the value lost by diverting readers from the publishers’ main site, to say nothing of its print product. Aggregation, in other words, has been very nearly a zero-sum game, in which value captured by the aggregator is lost in almost equal amounts by the publishers’ whose content is aggregated — or so publishers maintain. I think that’s a misperception, however. Aggregators like Flipboard don’t so much steal value from publishers as create second-order value chains around content by making it easier and more convenient for users to access the content they want, and to customize it, share it, clip it and incorporate it into other applications. The real problem facing Conde Nast and other traditional publishers is not aggregation per se but the lack of tools for participating in the sort of second-order value chains aggregators create. That’s why I think the Times’ new approach to Flipboard is more interesting. While paywalls by themselves do not necessarily get you into second-order value chains, integrating your paywall with platforms that enable those second-order value chains just might. Hopefully, the deal between the Times and Flipboard can evolve to where Flipboard isn’t just layering itself on top of the Times’ paid subscriptions but is selling those subscriptions itself under license from the Times, or selling a la carte access to individual stories directly from the app, or enabling any number of other paid content models on behalf of the Times. Aggregation is going to happen online, regardless of what publishers think of it, because users — their readers — want it to happen. The key for publishers is not to try to stop it but to understand how and where value is really exchanged online and then building the tools that let them participate in those value chains. Integrating with aggregators’ applications on a paid or licensed basis seems like a better starting point than simply taking your content and going home.